The USB Car Charger Gift Set includes a USB Car charger, USB adapter cable and an emergency USB mobile device battery charger. 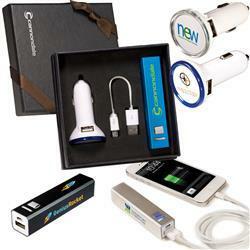 Includes the Emergency Mobile Device Battery/Charger and the Commuter USB Car Charger with Pad Print. 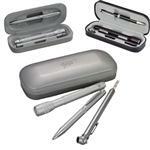 Portable lithium battery in aluminum shell allows you to charge your devices virtually anywhere. Includes standard USB connector cable to charge battery from your computer or any USB port with a power supply. Rated Voltage: 5 V; Rated Capacity: 2200mAh; Input (DC IN): 5V-500mA; Output (USB OUT): 5V 1000mA. Charge time: approx. 6 hours. RUSH IS AVAILABLE! 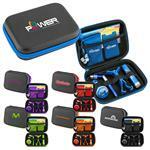 Gift Set includes: Emergency Mobile Device Battery/ Charger, Commuter USB Car Charger With Pad Print. Carton Size: 14.00" x 18.00" x 16.00"